Just about everyone gets paranoid when it comes to moving fragile items, because we’ve all been burnt before. Maybe you hired movers who had another house to get done by the end of the day so they threw around your boxes of china like they were about to explode. Maybe your intrepid pal Ryan sneezed and dropped your grandma’s porcelain dolls down a flight of concrete stairs. Having something you care about get damaged or destroyed by carelessness, an oversight or a simple mistake is a bummer, especially if you weren’t responsible. You shouldn’t have to go into a move wondering if you’re still going to have all the things you started with by the time the boxes have been unpacked. Finally getting moved in only to find that something you love was damaged is not a good first day in a new place. That’s why you should make the time to prepare for your move and take care of the things you care about. As you know, it is practically impossible to prepare for everything that might happen to you or your beloved things during a move. If a global extinction event happens while you’re unloading your mother’s beloved, brittle Ancient Greek Pottery collection, it doesn’t matter what kind of packing material you stuffed in the boxes–it’s going down. What you can do, however, is maximize the safety of your fragile items through planning, care and a couple simple strategies. Here are a few of those strategies that could make the difference. This rule applies whether it’s referring to packing individual boxes or stacking boxes on top of one another. When packing, put your heaviest things in the bottom of your boxes, and then put your heaviest boxes at the bottom of any piles you need to make. This will weigh down the boxes, making it less likely that they’ll tip over in a moving van or car. It will also make them sturdier and easier to carry, instead of top-heavy. Heavy items at the bottom of boxes can also help by preventing the lighter items packed above them from having as much room to move around. Heavy items are less likely to be jostled by sudden or jerky movements if they’re packed together tightly, so be sure to use your packing material liberally. 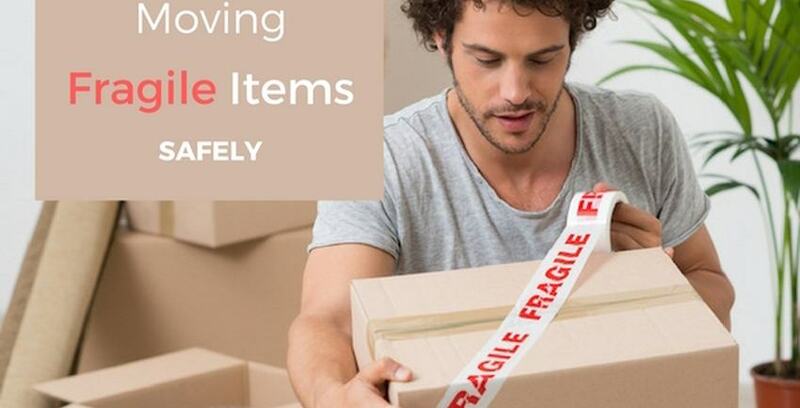 You may even want to consider packing particularly fragile items on top of heavier items that are unlikely to break or put the fragile items above them in danger; by wrapping your dishes up in your bed’s comforter and sheets, for instance, you’ve introduced another level of padding for a fragile item. Similarly, placing heavy items at the bottom of stacks of boxes will make them less likely to slide around, causing damage to other boxes–or you! Whatever you do, don’t put your heaviest boxes near the top of stacks. It sounds obvious, but the higher heavy things are, the more damage they can do to themselves, other items and you when they fall or slide. Heavy boxes might also crush the boxes beneath them. Be careful with how much you pack into any given box–broken boxes are one of the leading causes of injury and damage on moving day. When it comes to keeping fragile things secure, tissues and crumpled up newspaper often doesn’t cut it. Even if you think you’ve packed securely enough or you think it’s overkill, it’s a good idea to use packing peanuts and bubble wrap liberally. There should be nothing moving inside any of your boxes before you tape them up. There are special boxes for packing special items, such as dishes. These can add another level of protection to particularly valuable property such as china or antiques. Make sure you give special consideration to items that might be damaged if anything bumps up against them. You might even consider using smaller boxes to individually wrap and pack items you’re particularly worried about, such as porcelain, china or artwork. One of the golden rules of moving is always bring more than you think. Get a few more boxes than you think you need, a little more bubble wrap, packing tape, etc. It’s always better to be over prepared than underprepared. If it turns out you don’t need the boxes after all, they won’t take up much space if you deconstruct them, and they can provide additional barriers for boxes being packed into cars or trucks. Similarly, spare cardboard can be packed into boxes to make barriers between fragile items. It might seem tedious to have to buy supplies just to move, but in our experience quality packing materials are an investment that is very rarely regretted. You’ve probably labelled fragile boxes, just like that handsome young man up top. If you write what, specifically, is fragile in your boxes, however, you’ll know how to handle each particular box. If you have something that can’t be turned, for instance, you know to keep that box face-up at all times. Using specific labels can be especially helpful if you hired movers to help you. We all know to be careful around boxes labelled “fragile,” but a specific label is a helpful reminder of why we’re being careful. After seven hours of unpacking box after box, you might find your concentration slipping, but if you see a box labelled “PRICELESS ANTIQUES DO NOT BOUNCE,” you’re going to be careful no matter how tired you are (or how badly you want to bounce something). The expression “if you want something done right you have to do it yourself” feels appropriate here. It may seem like a pain, but if you have something you’re really worried about, consider making a plan to take care of it yourself. Instead of putting it in the truck or trunk of your car with everything else, have one of your moving buddies actually hold onto it personally. Always know where things with this are, consider moving them first or last and make sure everyone knows how important it is to be careful with them. You’re probably never going to be 100% comfortable moving your mom’s brittle Ancient Greek pottery collection, even if you’ve overpacked so much it looks like your boxes could survive a nuclear blast. If you always know where it is or even better, are physically holding it in your hands, however, you’ll reduce a lot of the potential stress of your move. If you have a lot of things like your mom’s pottery collection, you could consider packing and preparing separate trips. Put your fragile or significantly valuable items in your car and follow the moving truck packed with everything else. You could even make multiple trips if that is a feasible option. Moving day is stressful enough without having to be afraid of whether or not your stuff is going to survive the trip. Follow these steps and make sure you take enough time to be thorough and careful in both your packing and your moving. Are you interested in a few other moving day tips for reducing stress and danger? Check out a few of these other blogs. If you run out of space and need something important looked after, we hope you’ll consider Storage Direct for your needs. We have facilities to accommodate virtually any need you may have. We can take care of those pesky Ancient artifacts your mother is so fond of, even if you think they belong in a museum.